Oh, the Holiday Hell Show is off and running and today we are going to talk about pure Christmas in a bottle. Seriously, if Santa got drunk and depressed over the war on Christmas and decided to slit his wrists in the tub, there would be Holiday Cheerwine Punch everywhere. Okay, let’s start over. The makers of Cheerwine have put out a limited edition Holiday Punch which is a little lighter in color and fruitier in taste than the original. If you have not had the original, I suggest you give it a whirl. As a local to North Carolina, the home base of Cheerwine, it take it for granted and assume everyone has had it. I learned that is not the case when I have visitors. If you have the means and are within distance of picking Holiday Cheerwine Punch up, please do so. If not to drink at least to put on the table and enjoy the hue of fallalalalalalalalalalalalalalala. I made a quick video to show it is not only drinkable but also why I should never use hair products. Enjoy! Whenever I’m watching your new videos and Owen’s nearby he’ll point at the screen and say “Halloween room!” LOL That’s what he called your office when he visited. 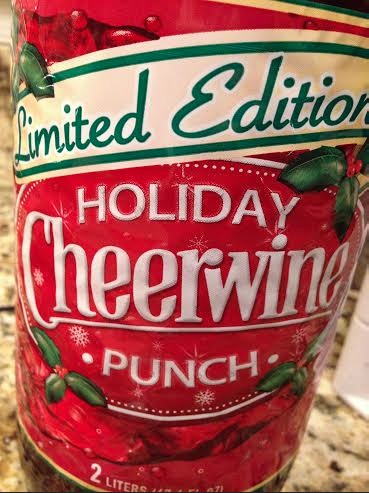 Kudos to Cheerwine for this holiday blend! I’ve got a bottle of Pepsi Holiday Spice somewhere in storage that I’m dying to find and drink one of these holiday seasons for RtW. Might need to try this.